Artists of the Counter-Reformation bring home the Church's complex and difficult teachings on the Virgin Mary. On the 500th anniversary of the Protestant Reformation, this series of articles looks at how the Church responded to this turbulent age by finding an artistic voice to proclaim Truth through Beauty. Each column looks at how works of art were designed to confront a challenge raised by the Reformation with the soothing and persuasive voice of art. You can find more in this series, here. The Protestants, however, tended to view Mary’s role as a passive one. A vessel, made to receive God and then to be placed on a shelf for admiration and emulation, while the Catholics saw Mary as constantly active on our behalf. Her fiat had grown in Catholic teaching beyond a submissive yielding to divine will, into an active trust in and cooperation with God and intercession for others. In developing her thought regarding the Blessed Virgin Mary, the Church anchored her life in two supernatural events, not explicitly found in Scripture, and therefore suspect for Protestants. One event was her Immaculate Conception — that she was conceived in the womb of her mother without the stain of original sin — and the other her bodily assumption into Heaven. Although only recently defined as dogmas, these devotions have existed for centuries, developing through the years from the understanding of the early Church. In 1476, Pope Sixtus IV had included the Immaculate Conception in the liturgical calendar and dedicated his Sistine chapel to her Assumption. In this era, Marian imagery was evolving away from icons and into the more action-packed world of Renaissance narrative. Mary was often compared to Eve, whose sinful action had helped bring about the Fall; therefore Mary, through her active obedience, would help implement Redemption. 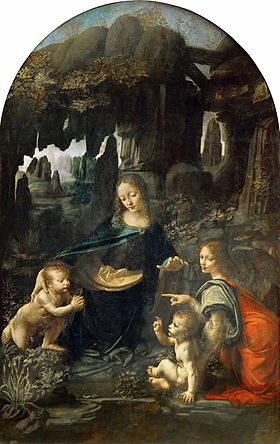 Although the Immaculate Conception reflected Mary as the heroic figure prepared at the beginning of time for her tremendous undertaking, art struggled to keep up with this heady, non-narrative concept, employing the likes of Leonardo da Vinci to delve into this complex theology in his Virgin of the Rocks. Michelangelo even took a crack at the subject in the Sistine chapel, by placing the Creation of Woman as the central panel of the ceiling; he underscored Mary as the New Eve, a theological notion dating back to the Church Fathers that was given its finest modern expression 300 years later by Blessed John Henry Newman. 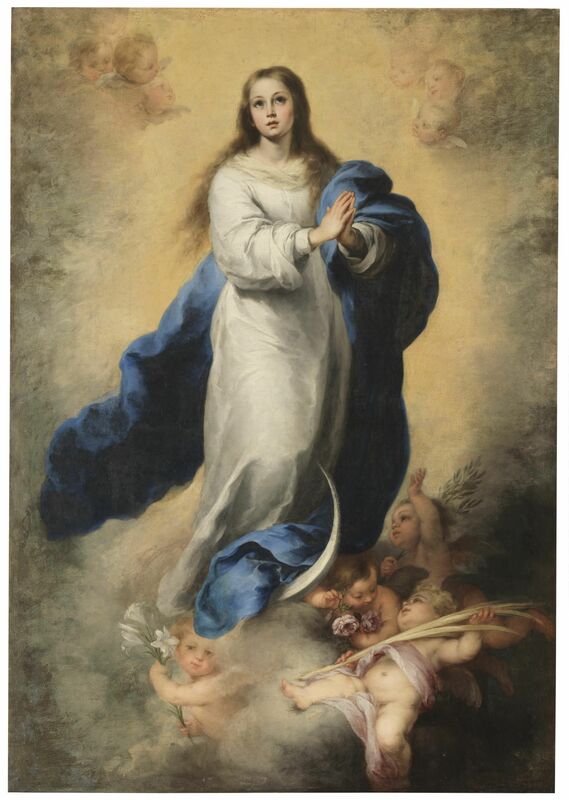 The Counter-Reformation called on art to help clarify this teaching for the faithful, and it was this era that ultimately created what would become the definitive iconography of the Immaculate Conception. The Church recruited the Carracci school, the artistic academy most attuned to the ideas of the Counter Reform. It was the restless, imaginative Ludovico who first endeavored to illustrate Mary of the Immaculate Conception in 1590 in the painting known as the Madonna dei Scalzi for the Bolognese Discalced Carmelites, founded by St. Teresa of Avila and St. John of the Cross 20 years earlier. Given this new imagery, Ludovico chose to show Mary with the infant Christ in her arms, keeping a more traditional iconography so as not to shock the public, and emphasizing the centrality of Christ to avoid Protestants’ accusations that Catholics held Mary in greater esteem than Jesus. The two saints flank her to reaffirm the continuous tradition of the Immaculate Conception: St. Francis, founder of the order that tirelessly promoted the Immaculate Conception, and St. Jerome who succinctly stated, “Death by Eve, life by Mary” back in the 4th century. Ludovico’s work was continued by one of his finest students, Guido Reni. Reni produced a great many images of both Marian doctrines, but perhaps his most beautiful effort was painted for the king of Spain. Without saints, Church doctors or the Christ child, Mary floats on a crescent moon supported by a trio of angels. More cherubs surround her as she gazes raptly toward the heavens. Her clothes retain the traditional red and blue, but the golden light that suffuses her alludes to the abundant grace bestowed on her. Bartolomé Esteban Murillo was a mere boy when Reni’s painting arrived in Madrid, bastion of the Immaculate Conception. This belief was so strongly held in the city that when in 1613, an itinerant preacher argued against the devotion, 40,000 citizens filled the streets to reclaim this singular honor of Mary. Murillo painted the subject repeatedly, and ultimately created the image we know today, which was later validated by the miraculous apparition of Mary at Rue du Bac. Mary, seen as youthful maiden untouched by age, now wears white, symbol of her purity from sin, under her blue mantle. The angels below offer up symbols of her glory. With Mary’s perfect purity (the lily) and with our prayers (the rosary), she helps us to persevere to victory (the palm) and eternal peace (the olive). Art worked no less tirelessly on the Assumption than the Immaculate Conception. An ancient teaching, the Assumption held that Mary knew no decay but entered Heaven with her body. The lack of veneration of any bodily relics of Mary or a tradition of her resting place underscores the antiquity of this belief. The earliest version of the feast, the Dormition of the Virgin, was often illustrated with a sleeping Mary with Jesus holding a miniature white version of the Virgin in his arms. An illustrated epilogue showed Mary crowned in heaven by her Son, but in the Renaissance the Assumption began to appear discreetly, usually showing Mary as a weightless sylph floating upward amid musical angels. Artists of the Counter-Reformation took on this subject with a little more difficulty. In 1605, Caravaggio painted an image of the Dormition of the Virgin, this time for the Discalced Carmelites of Rome. He chose to show the lifeless body of Mary surrounded by sorrowful apostles, leaving the viewer anxiously awaiting the Assumption. 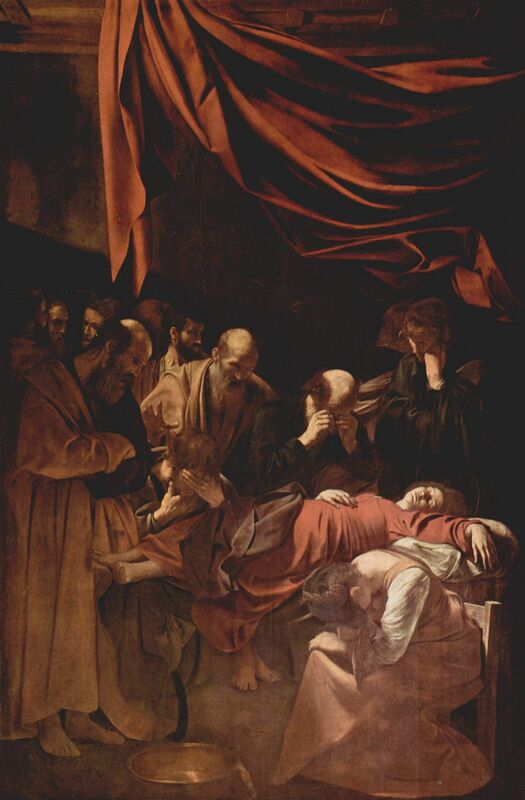 The commission had asked for the scene of Mary’s death, and Caravaggio complied by stretching a heavy middle-aged body sprawled and lifeless on her deathbed. Her feet are bared and ankles exposed and she is swathed in a red dress, symbolic of her mortality. Her blue robe of grace has dimmed to gray. The eye is led down toward Mary and then further down towards the ground, where she should soon be buried. But in the upper right, unseen by the group lost in grief, a light enters the room, drawing attention to the red curtain covering the upper part of the painting. This is only the end of the act, not the end of the play. That light, supernatural in nature—as there is no window nor lantern to produce it—promises that out of the darkness of this moment will come one of the most beautiful miracles in history, the Assumption. One must have faith … and patience. The Carmelites did not have patience with Caravaggio’s version of the scene and rejected the work. To replace it, they hired a less edgy artist, Carlo Saraceni, to repeat the commission. 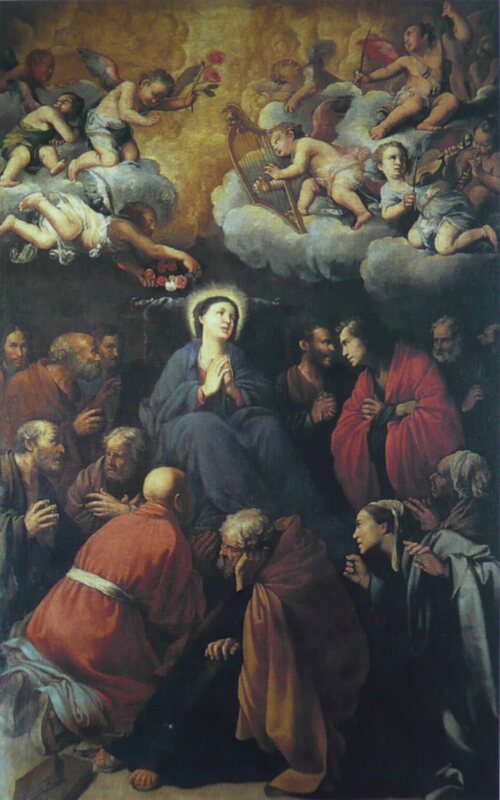 He shows the dormition with the apostles standing around Mary’s deathbed, but eschews the depiction of her lifeless body in favor of a Mary sitting up under the opening heavens, conflating the dormition and the assumption into a less challenging scene. Caravaggio was probably reacting to Annibale Carracci, who had become the Roman master of the Assumption with his painting in Santa Maria del Popolo. The altarpiece of the Cerasi chapel, where Caravaggio had painted the Death of Peter and the Conversion of Saul, Carracci’s painting had greeted the pilgrims during Jubilee year 1600 with a vivid reminder of the importance of Mary in the life of the Church. Annibale’s Mary is no waif-like creature, but a voluminous woman floating upwards. Her face radiant, Mary rises above the cavernous darkness of the tomb toward the golden light of heaven above. Her dainty bare foot points towards the viewer as if she might fly overhead while the astonished apostles look on in awe. The buoyant colors and the compressed composition underscore the glorious nature of this mystery; Caravaggio, on the other hand, ponders the fearful moment before the miracle. As the most depicted woman in human history, Mary offered artists opportunities to expand their creative capabilities. Accompanying the Church in her developing teaching on Mary, art created proportionately fascinating images of the Queen of Heaven.